A melt-in-your-mouth cookie bar you won't want to miss! This recipe is the same one my grandmother ("Nanny") has made since ... forever, I guess. About a month or two before Christmas, it didn't matter when you visited their house ... the smell of that buttery shortbread baking in the oven wafted through the entire house. This shortbread seems to be somewhat different than others. 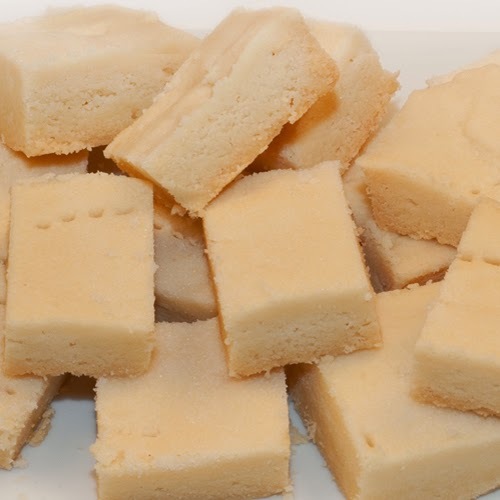 Whenever someone mentions "shortbread" what fills our thoughts is Nanny's idea of shortbread, but what we've often been given is nowhere close to this. Some shops sell "boxed" versions of Shortbread (Scottish or English) which is hard, and not at all "melt-in-your-mouth". We've been given "spritz" style cookies with a bit of cherry on the top that have also been called "shortbread" - Nanny often referred to those as "Irish Shortbread", but I have no idea why. Those particular cookies are made with icing sugar as the sweetener. Don't get me wrong, they are yummy, they just aren't "our" shortbread. And yes, I know ... that sounds kinda snooty (apologies). Since before I was born (in fact back before my mother was born) Nanny has been making this particular shortbread recipe, so for our family, this is shortbread and other cookies just aren't. The ingredient list for this recipe is pretty small – butter, flour, caster (fruit) sugar, and rice flour. That’s the sum total of all that goes into these, except a little labour and a lot of love. It’s important that you don’t substitute ingredients – use real butter. Don’t use margarine, butter substitutes, whipped butter in a tub etc. Not if you want to get the results that you are supposed to get. We use all purpose flour and always have. If you are using cake flour, you may have to adjust the recipe amounts because it tends to be a little finer than the all purpose type. Don’t use regular sugar – caster sugar is sometimes harder to find but it’s essential to getting the texture right. Don’t use brown rice flour either. Fruit Sugar comes in a small box (Lancing makes it), as does Rice Flour (Robin Hood or Purity), but both of these items can be purchased at many bulk food stores. In fact, if you can still find the boxed Rice Flour, the recipe is on the back … sort of. The recipe on the back of the box contains the same ingredients as Nanny’s recipe, but not the same instructions. 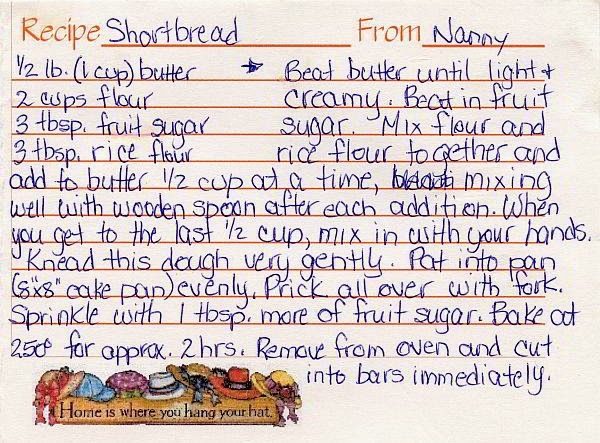 I’ll be honest and say I have no idea how long the box has had the recipe on it, but back when Nanny began making these shortbreads, there “weren’t no Rice Flour in boxes” (according to her), and she was rather appalled that “her” recipe was on that box. Since she never did divulge the secret of where her recipe came from, I can’t say how or where it originated. Creaming, then whipping the butter (which should be soft when you start – not melting, just soft) takes about five minutes. Start the mixer off at the “beating” stage and move slowly up to the “whipping” stage. When the butter is very light and fluffy, then you can begin adding the ingredients. Start by adding the fruit sugar, one tablespoon at a time and then beating it into the butter with the mixer. 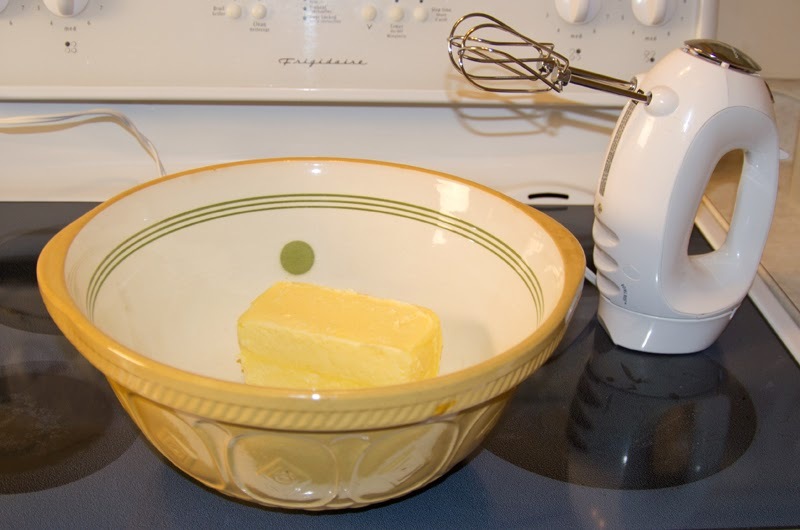 By the time you finish adding the sugar, you’ll notice the consistency of the butter has changed slightly. Mix the rice flour and flour together and add it to the butter, half a cup at a time, mixing it in with the beater/mixmaster until you have added half of the flour. Put aside the mixmaster, and continue adding the flour in one-half cup increments, but mixing with a wooden spoon. The final half cup should be mixed in with your hands (be sure to wash!). Yes, I know – lots of people don’t like to use their hands, but the only way to know the dough is “right” is by the way it feels. The mixture should be soft and pliable, and shouldn’t be sticking wetly to your hands. You may have a couple of small bits on your fingers, but large wet clumps of dough means not enough flour. On the whole, this doesn’t happen often if you make a “single” recipe batch – the ingredient amounts work out as they should. But in our family, this recipe is never made in a singlet – it’s always doubled. And doubling a recipe (as many cooks already know) doesn’t necessarily mean doubling all the ingredients. If you double this recipe, you may find four cups of flour far too much. 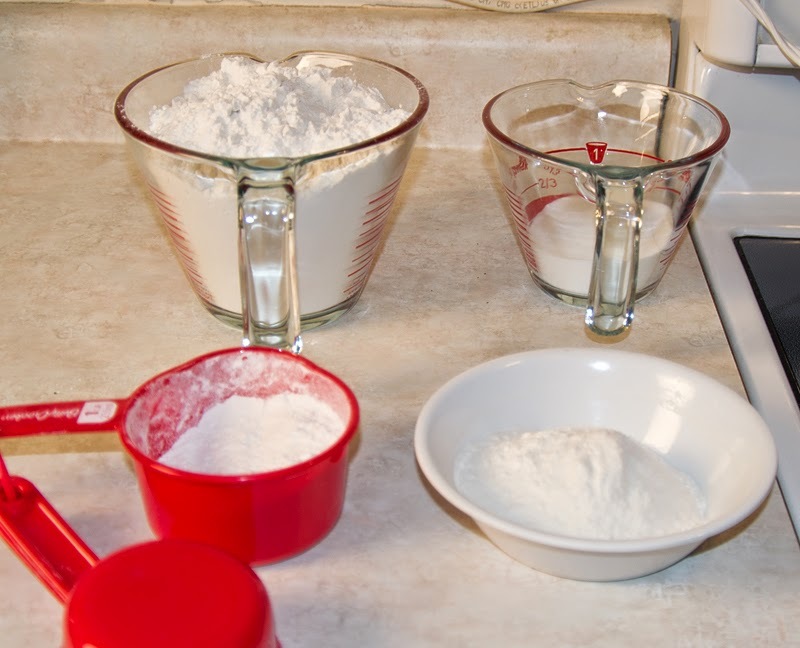 When setting out my ingredients, I set one bowl or container out with three measured cups of flour (usually a safe amount to add fully) and another three-quarters of a cup of flour in a separate container. After adding the three cups, I can decide at that stage how much more I need (if any). Today, when making up this batch (yeah, I made a batch just for this post – too bad you can’t taste it!) I only used three cups – and didn’t need the extra. I photographed the dough at various steps so you can get an idea of how it should look. It’s kind of hard to say how it should feel though – I had to teach my girls “hands-on” in order to get them to understand how this should feel. It should be soft, and hold it’s shape – it shouldn’t feel like most other cookie doughs, nor like bread dough. 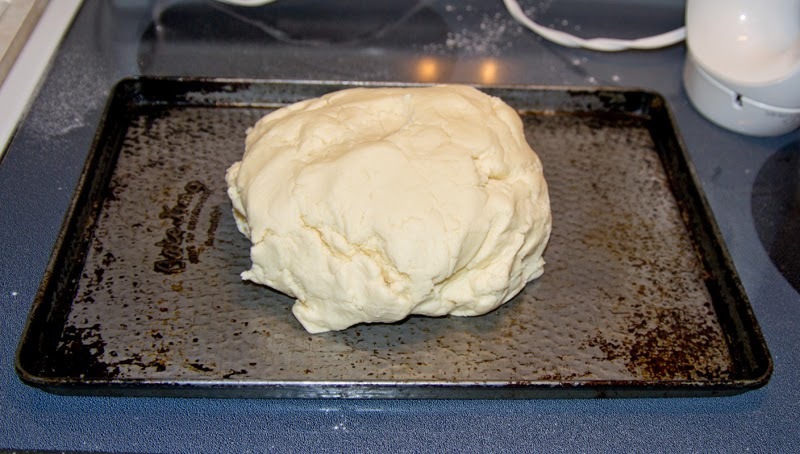 Spread the dough onto a cookie sheet and pat it down gently, spreading it out so it fills the entire sheet as evenly as possible. Prick the dough randomly with a fork, and sprinkle a tablespoon of fruit sugar on the top. 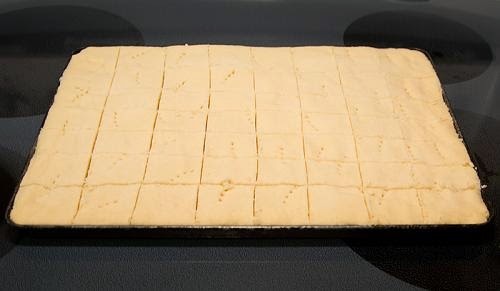 Bake the shortbread at 250 degrees for about two hours. The first time you bake this, you may need to watch it closely during the last hour. The oven at our new house is hotter than my old one, so I end up baking this for about an hour and fifty minutes. That temperature is the hottest you should bake these at. You can bake them at 200 degrees but it will take about two and a half hours instead. 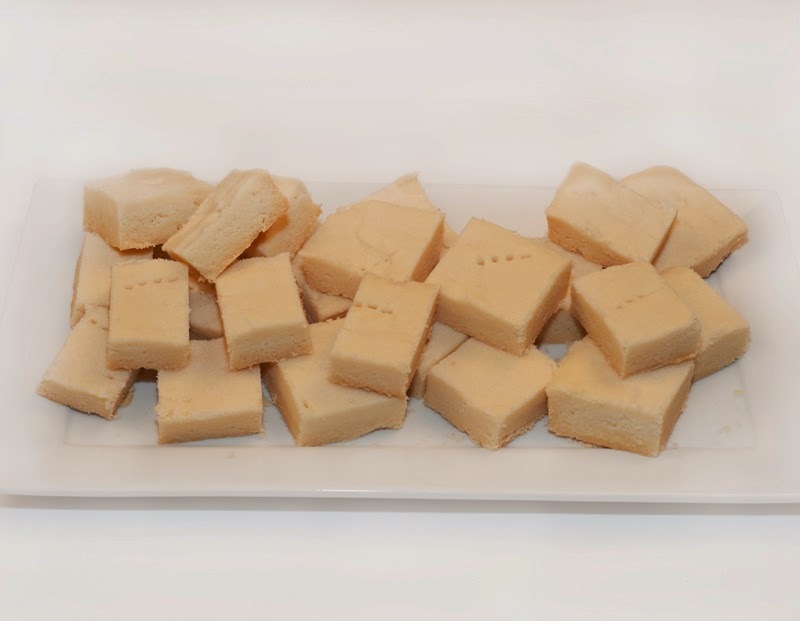 The shortbreads should be a golden colour – you don’t want them to get “brown” as that means they are over-cooked and will be “dry”. As soon as the tray is removed from the oven, you MUST cut these into bars immediately. If you wait til it’s cool, you won’t be able to cut them. While the instructions seem long, making these really isn’t that difficult – it takes about 15 minutes of prep-time (not including the clean up of course) and once you’ve made them a few times, you really don’t even need the recipe out any more. We do only tend to make these at Christmas, but not because they are traditionally a Christmas cookie – mostly because they are enormously fattening (that’s cause of all the butter) and we just can’t afford to be eating those on a regular basis. Today, my aunt will be benefiting from this impromptu batch of cookies. She’s in a nursing home and loves to keep her own treats in her room – these are one of her favourite, so now … I’m off for a visit to deliver the shortbreads. I have almost the same recipe from my Scottish nanny passed down from my mom. Have to knead with the hands. Warmth from the hands is crucial. My nanny's recipe also calls for 1 egg yolk.